Cellulitis is a bacterial infection involving the skin. It specifically affects the dermis and subcutaneous fat. Signs and symptoms include an area of redness which increases in size over a couple of days. The borders of the area of redness are generally not sharp and the skin may be swollen. While the redness often turns white when pressure is applied this is not always the case. The area of infection is usually painful. Lymphatic vessels may occasionally be involved and the person may have a fever and feel tired. The legs and face are the most common site involved, though cellulitis can occur on any part of the body. The leg is typically affected following a break in the skin. Other risk factors include obesity, leg swelling, and old age. For face infections a break in the skin beforehand is not usually the case. The bacteria most commonly involved are streptococci and Staphylococcus aureus. 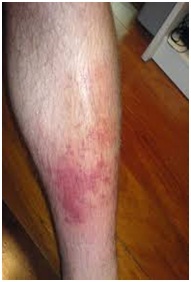 In contrast to cellulitis, erysipelas is a bacterial infection involving the more superficial layers of the skin, presents with an area of redness with well-defined edges, and more often is associated with fever. More serious infections such as an underlying bone infection or necrotizing fasciitis should be ruled out. Diagnosis is usually based on the presenting signs and symptoms with cell culture rarely being possible. Treatment with antibiotics taken by mouth such as cephalexin, amoxicillin or cloxacillin is often used. In those who are seriously allergic to penicillin, erythromycin or clindamycin may be used. When methicillin-resistant Staphylococcus aureus (MRSA) is a concern doxycycline or Trimethoprim/sulfamethoxazole may, in addition, be recommended. Concern is related to the presence of pus or previous MRSA infections. Steroids may speed recovery in those on antibiotics. Raising the infected area may be useful as may pain killers. Around 95% of people are better after seven to ten days of treatment. Potential complications include abscess formation. Skin infections affect about 2 out of every 1000 people per year. Cellulitis in 2010 resulted in about 27,000 deaths worldwide that year. In the United Kingdom cellulitis was the reason for 1.6% of admissions to the hospital. It's important to identify and treat cellulitis early because the condition can cause a serious infection by spreading rapidly throughout your body. • You have a rash that's red, swollen, tender and warm — and it's expanding — but without fever. Although cellulitis can occur anywhere on your body, the most common location is the lower leg. Bacteria is most likely to enter disrupted areas of skin, such as where you've had recent surgery, cuts, puncture wounds, an ulcer, athlete's foot or dermatitis. • Certain types of insect or spider bites also can transmit the bacteria that start the infection. Areas of dry, flaky skin also can be an entry point for bacteria, as can swollen skin. • Predisposing conditions for cellulitis include insect or spider bite, blistering, animal bite, tattoos, pruritic (itchy) skin rash, recent surgery, athlete's foot, dry skin, eczema, injecting drugs (especially subcutaneous or intramuscular injection or where an attempted intravenous injection "misses" or blows the vein), pregnancy, diabetes and obesity, which can affect circulation, as well as burns and boils, though there is debate as to whether minor foot lesions contribute. • The appearance of your skin will help your doctor make a diagnosis. Your doctor may also suggest blood tests, a wound culture or other tests to help rule out a blood clot deep in the vein of your legs. Cellulitis in the lower leg is characterized by signs and symptoms that may be similar to those of a clot occurring deep in the veins, such as warmth, pain and swelling. • Lyme disease can be misdiagnosed as staphylococcal-or streptococcal-induced cellulitis. Because the characteristic bullseye rash does not always appear in patients infected with Lyme disease, the similar set of symptoms may be misdiagnosed as cellulitis. Standard treatments for cellulitis are not sufficient for curing Lyme disease. The only way to rule out Lyme disease is with a blood test, which is recommended during warm months in areas where the disease is endemic. • Cellulitis treatment usually is a prescription oral antibiotic. Within three days of starting an antibiotic, let your doctor know whether the infection is responding to treatment. You'll need to take the antibiotic for up to 14 days. In most cases, signs and symptoms of cellulitis disappear after a few days. If they don't clear up, if they're extensive or if you have a high fever, you may need to be hospitalized and receive antibiotics through your veins (intravenously). • Usually, doctors prescribe a drug that's effective against both streptococci and staphylococci. Your doctor will choose an antibiotic based on your circumstances. No matter what type of antibiotic your doctor prescribes, it's important that you take the medication as directed and that you finish the entire course of medication, even if you start feeling better. • Your doctor also might recommend elevating the affected area, which may speed recovery. Various strategies can be tried to reduce bacterial skin colonisation but requires motivation from the family. Prevention of infected eczema is best done by proactive management of the eczema rather than repeated antibiotics alone. The infectious disease team is happy to see these patients as out-patients. The typical waiting time is a few weeks. If no cultures are available please swab any lesions plus the nose & groin for bacterial culture.  Encourage early presentation to the GP .  Household members are frequently also infected with Staph – it is appropriate to ask about skin infections and examine family members (even adults) to ensure they also receive treatment.  Some families may find adding Janola to bathwater useful for reducing the bacterial load on the skin. 5ml Janola per 5L of water twice a week. This is approximately 100ml for a 15cm deep full sized bath. Baby’s baths use a capful. Alternatives include antiseptic bath oils (oilatum plus, QV flare up). If there is no bath then Chlorhexidine washes or even Protex soap (these two not recommended in eczema).  Family to consider discussion with GP regarding other possible decontamination strategies (may include short/medium term antibiotics or intranasal mupirocin). Cellulitis is a clinical diagnosis based on the spreading involvement of skin and subcutaneous tissues with erythema, swelling, and local tenderness, accompanied by fever and malaise. The approach to therapy involves the identification of the likely source as either local (secondary to abrasion or ulcer or due to another exposure, such as an animal bite or seawater, which implicates particular bacterial species — P. multocida and V. vulnificus, respectively) or an uncommon bacteremic spread of infection. Distinctive features of the patient (such as the presence of diabetes or immunocompromise) or anatomical sites should also be considered in treatment decisions. Streptococci (groups A, G, and B) and S. aureus are the most frequently isolated bacterial species. Initial empirical antimicrobial treatment for moderate or severe cellulitis in a patient such as the one described in the vignette would thus consist of an intravenous cephalosporin (cefazolin or ceftriaxone) or nafcillin (vancomycin in patients with an allergy to penicillin), followed by dicloxacillin or an oral cephalosporin, generally for a course of 7 to 14 days. In patients with recurrent cellulitis of the leg, any fissures in the interdigital spaces caused by epidermophytosis should be treated with topical antifungal agents in order to prevent recurrences. Daily prophylaxis with oral penicillin G (or amoxicillin) should be considered for patients who have had more than two episodes of cellulitis at the same site. 1. Barzilai A, Choen HA. Isolation of group A streptococci from children with perianal cellulitis and from their siblings. Pediatr Infect Dis J 1998;17:358-60. 2. Binswanger IA, Kral AH, Blumenthal RN, Rybold DJ, Edlin BR. High prevalence of abscesses and cellulitis among communityrecruited injection drug users in San Francisco. Clin Infect Dis 2000;30:579-81. 3. Dancer SJ, McNair D, Finn P, Kolsto AB. Bacillus cereus cellulitis from contaminated heroin. J Med Microbiol 2002;51:278-81.